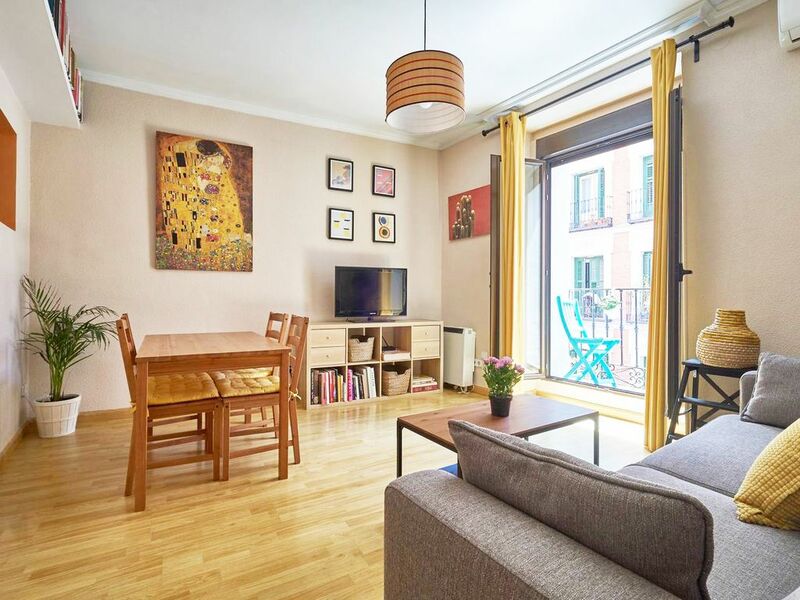 My flat is located in the downtown of Madrid in one of the most vibrant and cosmopolitan areas in the city, close to the main atractions (Sol, el Rastro, Plaza Mayor) and with bus stops and metro station just 2 minutes walking distance. It is a second floor with two bedrooms and a dining room. The dining-room is exterior, with a balcony. One bedroom has a double bed. And the second one has also a double bed and the possibility of a a single one. The bathroom is very large and comfortable. The kitchen is well equipped. There is also air conditioner. There are two balconies and a lot of sunlight. The kitchen is very well equipped. The apartment is very convenient for families and couples. There is an electric heating system very useful for winter. Clean cozy and clean flat close by to many attractions Plaza Mayor, Mercado San Miguel, Cathedral of Almudena, Royal Palace, Plaza España, food markets and restaurants also very close by. The flat was a walk up (3 flights) and in an area of town that was extremely hilly. Cab drivers considered it a dangerous area and either dropped us off several blocks away or charged us an extra fee. Neighborhood is transitional and full of recent immigrants. We were never afraid, just not very comfortable with all the challenges. The flat was very clean and quiet if the balcony doors are closed. Street noise especially at night was very loud. Our place was clean and spacious, both beds were in rooms of their own and very comfortable. We walked to most of the attractions...within 1-2 km. Host replied quickly to any questions. My only concern is that host wasn’t there to let us in, so after arriving we still needed to locate a grocery a block or 2 away. Be aware that there are a couple flights of stairs to walk up. Wonderful location for exploring Madrid! My cousin and I were visiting my daughter who is in Madrid for 5 months. The apartment was perfect, it had everything we needed and the owner, as well as the apartment caretaker, were helpful and responsive. And unlike some other rentals, it had a lot of daylight coming in. The location is central and there is activity in the area day and night. We sampled a few local restaurants and beer spots. I recommend it to anyone who wants to be in a neighborhood and get a local feel for downtown Madrid. Many thanks Sarah for been at my flat in Madrid. You will be very welcome in the future. Un apartamento muy agradable. Muy limpio y bien situado. El apartamento está genial. Limpio y bien situado. Se puede ir andando a las principales zonas turísticas. El dueño súper amable y atento.